The best Football Manager 2019 transfer update all-around. Featuring 18.322 changes until the 10th of April that FM 19.3 doesn't include! Initial version contains 18.322 changes until the 10th of April 2019 that happened after the 19.3 database lock-down. Post your suggestions and feel free to tell me your ideas either on this forum or in the comments below. How will this feature affect our games? Can we play this update without the CA/PA changes? Yes, the CA/PA file is a new file beside the others. If you don't want this file, simply don't choose it when you start a new game. Make a new "Career" game. Choose the "19.3.0 Update" database option and select my files. When setting up a new game, do not have any other data update files ticked on your Editor Data Files screen except this one. Choose only my files if you are not sure about the changes in every file. Many files together from different creators can cause crashes to the game, duplicates and other problems. Avoid using files from different creators. 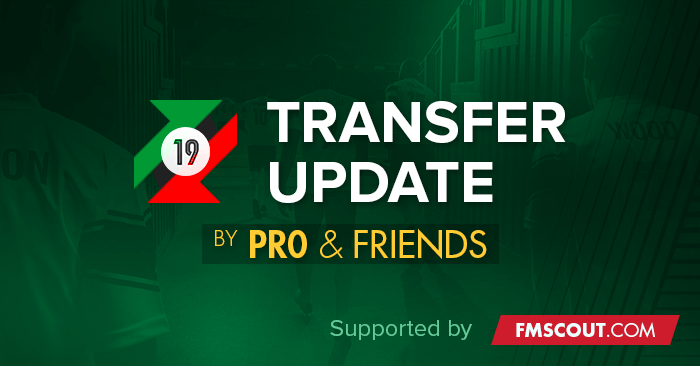 These FM19 Data Packs are created by pr0 and other contributors on the FM Transfer Update community. Make sure to visit the website dedicated to Football Manager Data Packs: FMTU. @OMARSHAKER, please provide specific information (which player is retiring in Novermber) and in which league, games are being postponed. ♦️ Version 2.3 of my #FM19 update packs is up! You need the official 19.3 patch to make these files work. Also, I don't work on previous FM games or on the 19.0 patch anymore. can you add brazilian updates? @董智华, the link redirects you to my website which has a perfectly easy way to download the file. There won't be any more private messages for that. @nicolas_style, no, there is no time available to update 2 different databases. Can we have a version that works with the 19.1 database please? Thank you ! The link works perfectly now. Can't download the link, can you please send me a private message? Thanks..
pr0 could you send me the download link? thanks! Link doesn't work Could you send me a private message? Thank you! @Emirhanfb7, for 19.1, yes, 1.6 was the last update. Is the 1.6 update for 19.1? last update was 1.6 ? @pr0, can't seem to get the link to work either. Could you send me a private message? Thank you! @Scoop, it's because of the website's ads. There is nothing to worry about. If you can't reach mediafire you can comment and I will privately send you the file. @Emirhanfb7, there won't be any updates for 19.1, there is no time available for that. @feazp1, check your private messages. uBlock Origin warns me not to continue when I click on download..